The Ministry of Mines website now features a new photo gallery with some maps of proposed railways. The National Resource Corridors map includes a Kabul to Kandahar railway “to be studied”. Historically this route was seen as a priority for developing a national rail network, but in recent years the focus has been on the more stable north of the country. The Regional Rail Networks map shows how things fit into the bigger picture. The Kazakhstan – Turkmenistan – Iran line paralleling the Caspian Sea appears to be absent, although recent news reports suggest part of it will open by October this year. A Soviet map from 1985 showing the railway line to Kushka – Кушка – extending across the border to Towraghondi – Турагунди – in Afghanistan. The pink and dotted line is the border, with Afghanistan to the south and west, the USSR to the north. www.angloafghanwar.info is an online resource for anyone interested in knowing more about the Second Anglo-Afghan War of 1878-1880. It is also the home of the Second Afghan War database project, a collection of names, family histories and stories concerning those who participated in this lesser-known campaign from the days Queen Victoria’s British Empire. The website has this 1895 War Office map, which, interestingly, shows the never-built railway from the Indian (now Pakistani) border at Chaman to Kandahar. British reconnaissance parties looking for a route for the proposed railway had reached Kandahar by December 1879, but they were in enemy country and so it was difficult to identify an optimal route. The British authorities realised it would not be possible for the railway to reach even as far as Quetta before the end of the war, and so the work was given a lower priority. When a new cabinet was formed under Gladstone in April 1880 they put the planned extension to Kandahar on hold. Pakistan Railways still runs to Chaman, and plans for an extension as far as Spin Boldak resurface every so often – it even appears on some more recent maps, though it has never existed. Amongst a collection of Historical Maps of India is Plate 24 Sect. III: Afghan Frontier, SE Afghanistan and west Punjab from the 1893 edition of Constable’s Hand Atlas of India, showing the never-built Chaman – Kandahar railway. 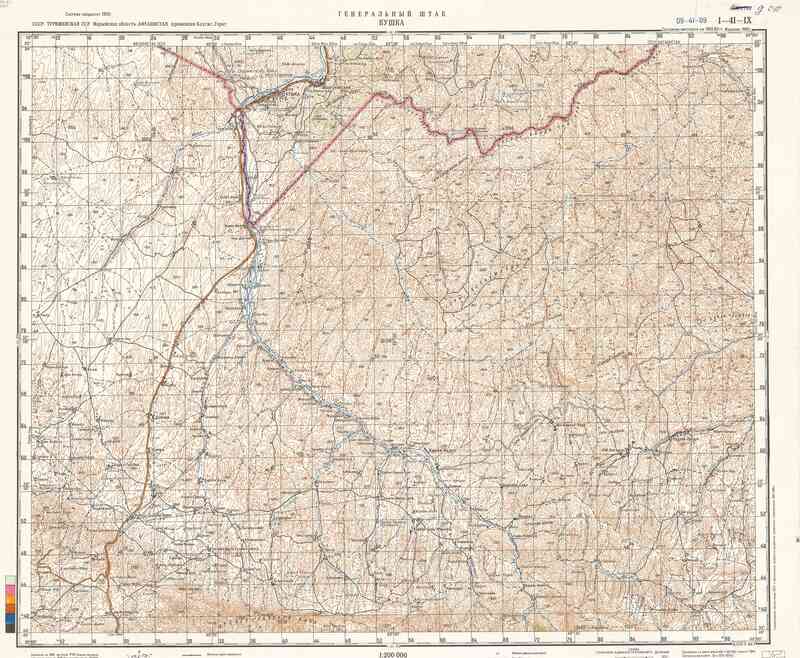 The Digital South Asia Library has a high resolution scan of the 1909 Imperial Gazetteer of India map of Afghanistan showing the Russia railway from Merv (Mary) to Kushka (Serhetabat) close the Afghan border. Asian Development Bank’s documentation on the 7th Ministerial Conference on Central Asia Regional Economic Cooperation held in Baku on 19–21 November 2008 includes a PDF with maps of the various railway proposals currently active in Afghanistan. Railway Development Plans in Afghanistan (2.2 MB PDF), was a presentation by Dr Wali Mohammad Rasooli, Technical Deputy Minister, Ministry of Public Works, Islamic Republic of Afghanistan. A news release from the Asian Development Bank, dated 28 April 2009. ADB has also published Islamic Republic of Afghanistan: Railway Development Study (PDF), with some background and a handy map. MANILA, PHILIPPINES – Afghanistan’s push to develop a railway system that will spur economic growth and make the country a key transit and trade route within Asia is to receive support from the Asian Development Bank (ADB). ADB has approved a technical assistance grant of US$1.2 million to fund a feasibility study for two key railway routes in the north of the country. The focus will be on railway lines linking northern Afghanistan with neighboring Uzbekistan and Tajikistan. Land-locked Afghanistan has seen major improvements in its road network in recent years, with support from ADB. However, only half the roads that connect 24 provinces in the country are serviceable throughout the year and the system remains inadequate, inefficient and, in some places, unsafe. Rail provides a more reliable and cost-effective option for moving people and goods, and can help Afghanistan unlock its significant mineral, industrial and agricultural wealth. An expanded rail system will also help Afghanistan realize its strategic potential as a gateway linking Central, South Asia and the Middle East, and supports the Central Asia Regional Economic Cooperation (CAREC) group of countries’ transport corridors program. Feasibility studies will be carried out on two proposed railway lines linking Hairatan, on the border with Uzbekistan, to Herat, in west Afghanistan, and another starting at Shirkhan Bendar, on the border with Tajikistan, and traveling via Kunduz and Mazar-e-Sharif to Herat. ADB will assess long-term traffic demand, and the rail sector’s potential capacity, before making recommendations to the Government on the two routes. The total project cost is estimated at $1.26 million with the government making an in-kind contribution equivalent to $60,000. The Ministry of Public Works will be the Executing Agency. Since 2002, ADB has approved financial support of over $600 million for Afghanistan’s transport and communications sector, mostly for roads. This is over 40% of ADB’s overall assistance to the country and around 25% of all donor financing for Afghanistan’s roads. The new technical assistance grant is included in the ADB’s 2009 pipeline for nonlending products and services for Afghanistan, as set out in the ADB’s Country Partnership Strategy: Afghanistan, 2009-2013. On the Map: Supplying Troops in Afghanistan looks at some routes into Afghanistan. Afghanistan Information Management Services (AIMS) has a PDF of a Major Overland Route Map into Afghanistan . Various rail and road routes in the neighbouring countries are shown.